Lap swimming can be a little intimidating while first starting out if you don’t know what to expect! Whether you’re a brand new swimmer or just want to brush up on your etiquette, we’re here to help. You might even be heading to a bigger, more crowded pool that requires more attention to what you’re doing. Wherever you’re headed next, we have you covered with all the pool rules you’ll need to have a great workout in the water! You have your swimsuit on, goggles strapped, Underwater Audio iPod and headphones playing, and you’re approaching the pool. Now what? First, take a look at the ends of the lanes. Usually they will be labeled with slow, medium and fast signs or something similar. 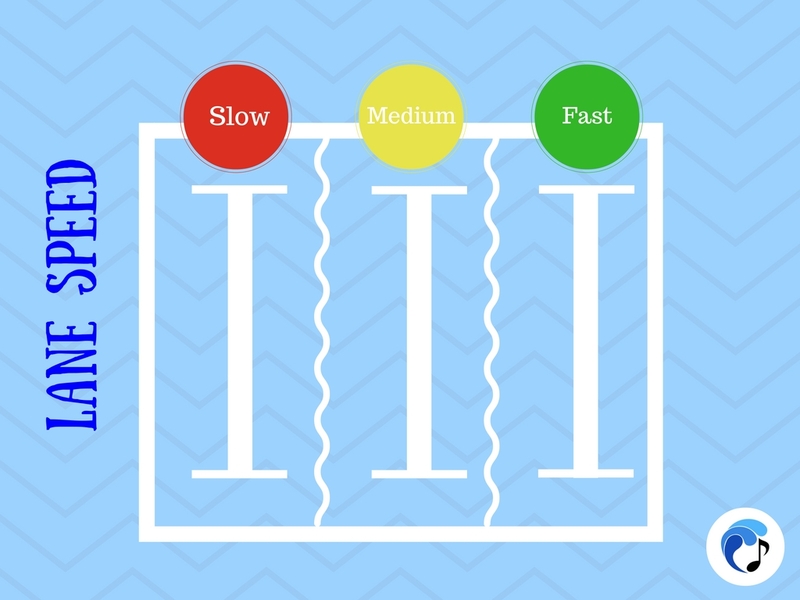 If you’re just starting out, consider beginning in the slow lane. Then pay attention to how many people are swimming. Are there empty lanes? If not, don’t worry. It’s okay to share! Even if the pool is really busy, fear not: your swim can still run smoothly! Try to pick a lane where the other swimmers are doing a stroke and speed you’re comfortable with. First, make sure to get the attention of the other swimmer to agree on what type of swimming pattern you will do. Lane splitting is a common way to share lanes if there are only 2 swimmers. This way, each swimmer chooses a side of the lane and stays on that side the whole time. This goes for turns too For example if you’re looking from a bird’s eye view of the pool, swimmer 1 would stay on the right side, and swimmer 2 would stay on the left. This method gives each swimmer a little less space, but also allows both people to go at whatever pace they choose. The second method or sharing lanes is circle swimming. Swimmers will swim in a counter clockwise pattern (or clockwise for those in the UK and Australia.). This is the only method that will work if there are three or more people using the same lane. 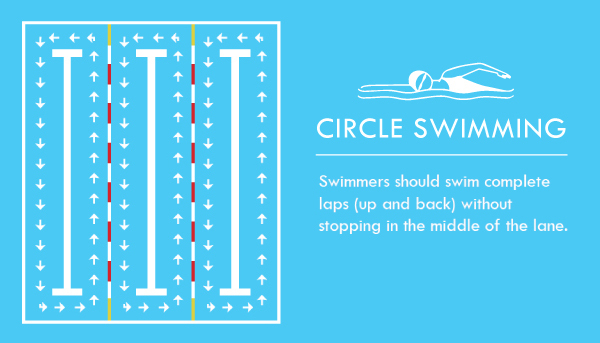 Circle swimming allows all participants to use a greater width of the pool (for the most part), but it works better if all swimmers are going at a similar pace. Even within a lane designated as fast, medium or slow, everyone is probably swimming at a slightly different speed. This means there may be passing within the lane. To indicate that you plan to pass, tap the swimmer in front of you on the toes and then pass on the left (or on the right, in countries where that is the norm for traffic). If you feel a tap or two, indicated by someone that wants to pass you, allow them to pass and/or stop at the wall when you reach it so the swimmer can get ahead. It’s okay to stop swimming laps workout without leaving the pool. If you need to rest or adjust your goggles, it’s best to get to the wall and go to the far corner on your left. That way other swimmers have enough room to turn! With this pool etiquette info, you can feel confident at your next workout! Tell us what you think! What else do you need to know before heading to the pool?